Brisbane Duo / Band 327 – Are you looking for high-quality, first-class entertainment at your event? You’ve found it! 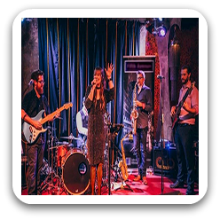 This funky-five-piece band is fronted by an incredibly versatile female vocalist, however what really sets them apart is their outstanding saxophone player, making Brisbane Duo / Band 327 very unique! If you are looking to get everyone straight onto the dance-floor, this is where Brisbane Duo / Band 327 have gained their reputation, with an extensive repertoire consisting of guaranteed floor fillers, as well as the diversity to deliver more laid-back music, they create the perfect atmosphere throughout your event. The five-piece line-up can also be adjusted to suit your requirements, from duo / trio, through to an six piece band. 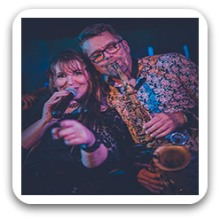 With their combined experience and backgrounds Brisbane Duo / Band 327 has the ability to cater to several genres, from jazz classics through to disco, pop and rock hits from the 70’s to now. Brisbane Duo / Band 327 provide their own PA system and lighting, and happy to play your personal play-list through their breaks, they also don’t mind dressing up for themed events! Ultimately the client’s satisfaction is the band’s number one priority. Whether your event is large or small, private or public, Brisbane Duo / Band 327 will provide the highest level of professional musicianship in their performance. Can perform as a: Duo, 3, 4, 5, & 6 Piece Band and are available to perform in Brisbane, Gold Coast, Sunshine Coast and Surrounding Areas.